In the early 1900's, cars still rode on carriage springs. After all, early drivers had bigger things to worry about than the quality of their ride - like keeping their cars rolling over the rocks and ruts that often passed for roads. Pioneering vehicle manufacturers were faced early on with the challenges of enhancing driver control and passenger comfort. These early suspension designs found the front wheels attached to the axle using steering spindles and kingpins. This allowed the wheels to pivot while the axle remained stationary. Additionally, the up and down oscillation of the leaf spring was damped by device called a shock absorber. These first shock absorbers were simply two arms connected by a bolt with a friction disk between them. Resistance was adjusted by tightening or loosening the bolt. As might be expected, the shocks were not very durable, and the performance left much to be desired. Over the years, shock absorbers have evolved into more sophisticated designs. Despite what many people think, conventional shock absorbers do not support vehicle weight. 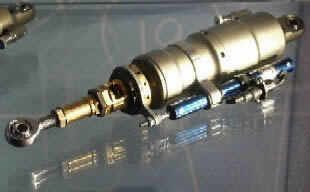 Instead, the primary purpose of the shock absorber is to control spring and suspension movement. This is accomplished by turning the kinetic energy of suspension movement into thermal energy, or heat energy, to be dissipated through the hydraulic fluid. You want more technical terms? Technically they are called dampers. Even more technically, they are velocity-sensitive hydraulic damping devices - in other words, the faster they move, the more resistance there is to that movement. They work in conjunction with the springs. The spring are one to suport car weight, and they allows movement of the wheel to allow the energy in the road shock to be transformed into kinetic energy of the unsprung mass, whereupon it is dissipated by the damper and heat. The damper does this by forcing gas or oil through a constriction valve (a small hole). Adjustable shock absorbers allow you to change the size of this constriction, and thus control the rate of damping. The smaller the constriction, the stiffer the suspension. Phew!....and you thought they just leaked oil didn't you? Shock absorbers are basically oil pumps. A piston is attached to the end of the piston rod and works against hydraulic fluid or gas in the pressure tube. As the suspension travels up and down, the hydraulic fluid is forced through tiny holes, called orifices, inside the piston. However, these orifices let only a small amount of fluid through the piston. This slows down the piston, which in turn slows down spring and suspension movement. The amount of resistance a shock absorber develops depends on the speed of the suspension and the number and size of the orifices in the piston. Because of this feature, shock absorbers adjust to road conditions. Shock absorbers work on the principle of fluid displacement on both the compression and extension cycle. A typical car or light truck will have more resistance during its extension cycle then its compression cycle. The compression cycle controls the motion of a vehicle's unsprung weight, while extension controls the heavier sprung weight. During bump, the dampers and springs absorb the upward movement from cornering or road irregularities (the springs store some of it). Acceleration, braking or cornering in this state with also vary due to the various download rates, so it is important to have enough bump stiffness to be able to deal with uneven surfaces. If there is too much damping, then it is effectively like running no suspension and any upward motion will be transmitted directly to the chassis. Over damping will result in a increase in the loads acting on the suspension and the tires. The handling will feel very harsh and hard, this will effect street driving in terms of comfort levels, so might not be desired for a daily drive. This is undesirable in both under and over damping settings as it will reduce the handling of the car and will affect acceleration, braking and cornering loads. During rebound (following the bump compression phase) the dampers extend back to their original positions, using up the stored energy from the springs. The rebound stiffness needs to be set at a higher value then the bump setting as the stored energy is being released. If there is not effect damping on the rebound, the wheel will quickly return through the static level and start to bump again, with the bouncing effect unsettling the suspension with little control. If there is too much rebound stiffness, then the wheel could hold longer in the wheel arch then needed, effectively losing contact with the road as the force to push the wheel back down is slower to respond to the changing surface level. This state is again far from ideal and it is best to make sure a good level is set for optimal tire/tire contact with the road. As the piston and rod move upward toward the top of the pressure tube, the volume of chamber A is reduced and thus is at a higher pressure than chamber B. Because of this higher pressure, fluid flows down through the piston's 3-stage extension valve into chamber B.
Piston is attached to the end of the piston rod and works against hydraulic fluid in the pressure tube. As the suspension travels up and down, the hydraulic fluid is forced through tiny holes, called orifices, inside the piston. On the picture left is modern design for use in road car dampers. The image above shows a typical modern coil-over-oil unit for long time in use with sports cars and motorcycles. This is an all-in-one system that carries both the spring and the shock absorber. The adjustable spring plate can be used to make the springs stiffer and looser, whilst the adjustable damping valve can be used to adjust the rebound damping of the shock absorber. More sophisticated units have adjustable compression damping as well as a remote reservoir. Whilst you don't typically get this level of engineering on car suspension, most motorbikes do have preload, rebound and spring tension adjustment, and this adjustments are normal in racing. Shock absorbers work in conjunction with springs and stabilizers. Dampers provide a resistance for the spring to work against. The purpose of this is to prevent the spring from oscillating too much after hitting a bump. Ideally, the spring would contract over a bump, then expand back to its usual length straight afterwards. This requires a damper to be present as without one, the spring would contract and expand continually after the bump, providing a rather horrible ride! 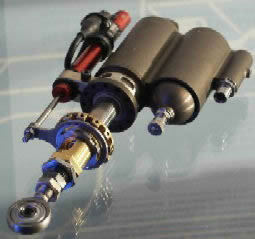 Modern F1 and racing shock absorbers can be regulated for bound and rebound but only before race. Shock absorber does not absorb impacts, but damp the motion of the car and oscillations of the spring after traveling over bumps and dips. When weight transfers from back/front and side/side (roll), or when you go over a bump on the road, the wheels/tires compress (bound), and when you are past the bump the wheel returns to equilibrium after the compression (rebound). That is basically the suspension movement. Bound is the rate at which the shock compresses. Rebound is the rate at which the shocks decompress. Bound damping affects how far and fast the suspension travels up. When the suspension is on its way back down, rebound damping affects how far and fast it goes the other way. More precisely, bound damping affects the compression rate, while rebound damping affects the expansion rate. If you make your bound damping too stiff, your car will be skittish over rough surfaces. Rebound damping also affects your steering as you transition into and out of corners. In general, stiffer absorbers are better suited for flat tracks with sharp turns. They prevent your springs from coiling too quickly, which decreases the dip you have when cornering and braking. Softer adjusted absorbers are better suited for winding, coiling tracks, but they'll also lengthen your braking distance. So having bound at (for example) value of 9 and rebound at value of 2, make the car stiffer when absorbing a bump, compression is harder. The suspension on rebound will not return as fast. This suppresses weight transfer. Not very good because the tire won't make contact with the ground fast enough causing slip, that induce oversteer. On the other hand, bound at 2 and rebound at 9, absorbs more bumps, but returns the shocks the opposite way to fast. You'll find the car literally jump over small bumps. This is also undesirable, as the tire is not in contact with the road. Bound at 7 and rebound at 6, keeps the tires stiff and return to the ground slower. Having bound at 6 and rebound at 7, will result in a good stiff compression of shocks and a higher bound means the tires return a bit faster to the ground but not too fast. This is the ideal configuration, a slightly higher rebound. When Ferrari presented the F2003-GA at the beginning of year 2003, the ears of attentive listeners pricked up: aerodynamic genius Rory Byrne was talking about a completely new rear suspension development. Yet the specifics of what was new about Ferrari's rear suspension have been kept under close cover, and for good reason: trying to spy out a competitor's concept, understanding and copying it - this is common practice in Formula 1. Copying the cars driven by Michael Schumacher and Rubens Barrichello is, no doubt, well worth the effort: there's no denying the fact that the Scuderia Ferrari has become even more dominant after fitting their red racers with the new rear suspension. No less than 17 victories have been clinched by Ferrari's German-Brazilian drivers' duo since the new suspension component was first used at the Spanish Grand Prix in May of 2003 - including six one-two victories in2003 season. Despite all the secrecy: after more than a year, clever rivals have discovered what's behind the revolutionary new design: a development by ZF Sachs Race Engineering GmbH. The conventional dampers are installed on the car by one end being secured to the gearbox case, the other end to a rocker which re-orientates the movement from the pushrod into the movement of the damper. The rocker can be made up of several levers splined to a single shaft and requires several bearings to make the suspension movement friction free. This amasses into quite a lot of separate components which all need space to fit in. The damper concept was revolutionized in a joint project with Scuderia Ferrari engineers. Instead of the three conventional dampers of the rear suspension, two rotational dampers integrated in the rocker are now handling the bulk of the work, replacing two of the conventional dampers. The pivoted rocker is a type of "triangular lever arm" that diverts jounce and rebound motion from the wheel to the spring, anti-roll bar and - in previous systems - to the conventional dampers. The new rockers with integrated rotational dampers are high-tech made by Sachs. Now, the Formula 1 racers from Maranello are using only one conventional damper in the middle, which responds when the entire chassis - due to the downforce at high speeds, for example - is pushed against the track. Approximately nine months of development time were invested in the rotational damper. Essentially, the Rotary damper change the axial movement of the linear damper into a rotational movement. All the components have the same function, they just move in a different direction. Thus the damper body is deep “delta” shaped pot and the damper rod, known as the vane, rotates in the body. The vane arm sweeping through a small angular rotation in the “delta” shaped pot section of damper body. The damping valves are placed in the face of the damper vane and work in exactly the same manner as a linear damper. Briefly stated, the new system operates as follows: the motion of the rear suspension link during jounce and rebound is transmitted to the rotary damper body acting as rocker. Damper body rotates and the damper rod with vane on it is fixed to the gearbox via splines. 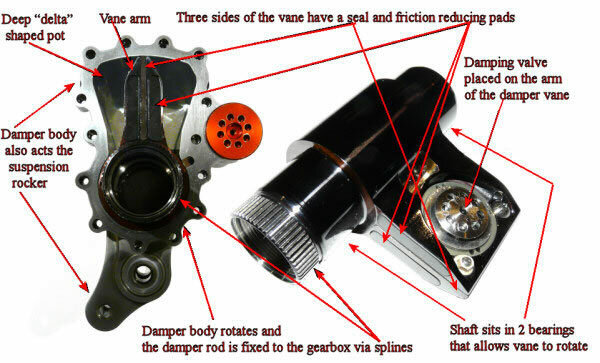 As damper body rotates and the vane remains static, the vane moves through the oil filled cavity and "pumps" oil from one side to the other through valves with specifically defined oil ports to generate the necessary damping forces. The rotational damper consists of five main components contained in a housing machined from a billet of titanium meeting aviation industry specifications. The major know-how, though, is found in the particular sealing technology used, which ZF Sachs had previously tested in active anti-roll bar systems for production cars. 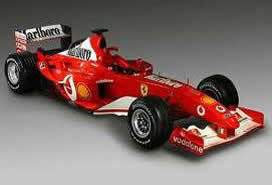 When operating in the Formula 1 Ferrari, the damper is subjected to approximately 160 bar of internal pressure. As the housing also acts as suspension rocker, there are also elements machined into its outer face to provide this function. Housing acts also as the rocker linkage, so a rocker arm is part of the machined shape. This accepts the anti roll bar and all other linkages. Damper vane is machined from solid, single block of titavvnium. The damper vane is made of two shapes. Shaft that sits in the bearings that allows the arm to the rotate and flat plate shape formed into the vane. This part is equivalent of the Linear dampers damping rod. This arm needs to be closely fitted to the damper cavity in order to accurately control oil for better damping effect. Three sides of the vane have a seal and friction reducing pads. Edges need to be sealed against the housing. A single square edged seal is fitted into a machined groove around the periphery of the vane. Providing damping effect the damper valve is a simple circular shim stack arrangement fitted to hole machined into the vanes face. This valve set up is almost identical to the set up used on the end of a linear damper. This is perhaps the only aspect of the rotary damper that directly echoes a linear set up. Rotational dampers offer a host of benefits: first and foremost, they save space, as the conventional dampers are omitted. Because of the rocker integration, the system is very stiff and direct, so there is little losses due to backlash in linkages, ball joints, etc. which meant it had a good high frequency response. This allows a more compact gearbox design and thus further improvements of aerodynamic efficiency. Besides space, rotational dampers save approximately 50 - 70 grams of weight - a significant reduction in the high-tech world of Formula 1 racing. Also, there is considerably less thermal stress on the new rotational dampers than on the previously used conventional units integrated in the extremely hot gearbox. Like the conventional system, the new solution operates with non-adjustable dampers during Grand Prix weekends. Engineers calibrate the dampers prior to the competition based on the results of dynamometer and track testing. The unique number of exploits achieved by Michael Schumacher and Rubens Barrichello clearly confirms the high performance capabilities of the rotational damper. As a negatives, there is a much more complicated sealing arrangement in the damper. Also, downside is that due to the high internal pressure, the hydraulic seals had to have reasonable preload, which induced a large amount of friction and hysteresis. This internal pressure also lead to structural issues. The high internal pressures can cause local deformation of the housing, as well as the deformation of the vane, and this lead to increased friction and pretty inconsistent damping characteristics. Initial developments started with aluminium, then titanium and steel options to gain stiffness to reduce the issues caused due to deformation. Away from the technical arguments is the budgets. They are a complex and high precision part and hey are very expensive, so not good value for money for the weight saving. Depending on the specification, price is in the region of about $20.000 per piece. With these being sealed dampers for each set up, a pair of dampers cost $40,000 would be on the car and a multitude of other dampers pairs in the pits, each set up for different damping characteristics. The engineering principle of the rotational damper has successfully passed its "baptism of fire" in motor racing, followed by the consistent delivery of superior performance on the world's circuits. Yet, chances that normal road users will enjoy the benefits of this high-tech component tend to be slim, as its price tag is ten times that of a conventional telescopic damper.